At PFS Med we care about the patient’s comfort and support during the healing process. That’s why our products are designed to be individually customized for just the right fit. When our splints have been sized correctly and form-fit by a qualified practitioner, they are worn more reliably and donned/doffed easily for exercises, dressing changes or wound care. This reduces complications and helps maximize optimal outcomes. Patients tell us they find the Tibial Ankle Foot Orthoses (TAFO) to be very comfortable and protective of the lower extremity. They also appreciate the ease of use, coziness of our liner, and the splint’s light weight feel. If the TAFO is too wide, it can be narrowed by placing hands around the sides of the PKO and pushing in to form to thigh. It can be widened, by placing the back of the PKO (now a KTAFO) against your chest and pulling at sides to expand. TAFO’s combination of malleability to form to the patient’s size and/or dressings, long calf lever arm and “blown out” heel are unique on the market. The longer calf length provides adequate support for ankle positioning at neutral. 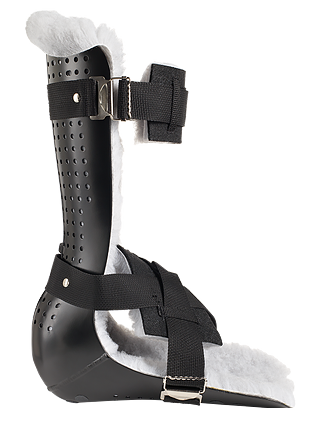 The “blown out” heel accommodates protruding calcaneus fractures as well as those with heavy feet/legs, preventing pressure sores at the heel. We rivet the straps and use a metal hook-slide buckle system which holds up for long term wear. PFS Med gladly provides training and support as needed. We hope your visit to our site has been beneficial. PFS Med welcomes the opportunity to answer any questions you have regarding our products, training or support.